I don't have to see your home to know your shame ... I have my own. But someone loved me just the way I am, and someone loves you just the way you are. Born as the result of a heart-wrenching decision made by his then 16-year-old mum, Reggie offers hope and inspiration to those who are stuck in the despair of their broken beginnings and are crying out for help. It is this first chapter in his life that sets Reggie on the journey of a lifetime - one filled with fear, regret, sorrow, and, ultimately redemption. Taking a chronological look at his life, Reggie reveals the transforming power of faith, weaving in personal anecdotes, biblical principles, and 10 ways to discover everything from your voice and your name to your hero and your passion. Prepare to discover, as Reggie did, that although you cannot change your past, you can change your future. Reggie Dabbs is a unique voice to this generation. The stories and principles you will encounter in this book will not only inspire you, but will also lead you on a journey to the core elements of life, and the potential therein to change. Best-selling author of In a Pit with a Lion on a Snowy Day, Wild Goose Chase, and Primal Lead Pastor of National Community Church, Washington, D.C. The very first time I heard Reggie speak was in a huge room full of young people who would normally be anything BUT attentive when hearing a speaker. But you could have heard a pin drop as he shared his heart and incredible life story thus far. The room swayed between silence, and raucous laughter. And as I grew to know, this IS Reggie's amazing gift! He plays a mean saxophone, communicates the message of Christ like no other, and through this book, I KNOW that your heart will be moved with compassion and stirred to action. Be blessed in the reading as you get to know the heart, mission, and passion of my friend, Reggie Dabbs. Reggie Dabbs is one of the strongest, most influential voices that God has raised up to speak to this generation. He carries a special anointing to touch vulnerable hearts in desperate need of God's love. You will be deeply blessed as you read through each page of this book. His life story can be summarized in one word, miraculous! I've known Reggie for ten years. Every time I see him, whether it backstage at a convention center before he goes up to speak to a room full of teenagers, by chance in an airport, or while he's on stage playing sax, I smile. He's that kind of guy - the kind you can't be around without feeling a bit of sunshine. Through his fiery, passionate testimony, Reggie has impacted multitudes of lives worldwide while inspiring people to live a life of excellence. His story will encourage you that no matter what background you come from, God has a plan and purpose for your life. I love Reggie Dabbs because he is the same on stage and off; he is the real deal. You're going to love this book! Reggie Dabbs' communication style spans generations. His engaging demeanor, biblical perspective, and phenomenal life-story have given him an overcoming spirit that would challenge and encourage even the most downcast soul. Reggie Dabbs is one of the most influential speakers of the 21st century. Reggie's life has inspired millions across the globe. He has a unique gift and anointing; this book will revolutionise your life! It is a must read and it will change your future. Why do untold numbers of people listen to Reggie Dabbs speak every year? Read this riveting book about the man and his mission. You will "find your voice." You will "learn your true identity." Most of all, you will "discover your God-dreamed" destiny. With God, all things are possible! Through his raw and real way of speaking, Reggie unabashedly shares the gospel and his life experiences to challenge and change our generation of young people for Christ. Every parent, youth leader, and teacher should read this book. It's an honour to call him my friend and to serve alongside his ministry through many conferences around the world. Forget Raymond - everybody loves Reggie! You would have to try really hard to not love this guy. Reggie has a unique ability through who he is and the message he speaks to break down walls and barriers around the hardest of hearts. Some people have messages, but with Reggie, his life is a message - a message of faith in God and the power to overcome. When you are around him, whether it in be in a stadium of thousands or in a room with a few, you see someone with an immense passion for God and people. You can't help but be impacted by it. Reggie is the real deal and this story is a "must read!" Not only is Reggie Dabbs the best student communicator alive - his message is even greater - God can lift your life out of any circumstance and fill it with his destiny and purpose! There really is only one Reggie Dabbs. He is unique . . . I would daresay, a phenomenon! His story is an inspiration. His energy is inexhaustible, and his legacy in our nation profound. It is impossible to count the number of young Australians he has helped through his message of hope. He has been a reference point for a generation who says, "if Reggie made it, so can I!" 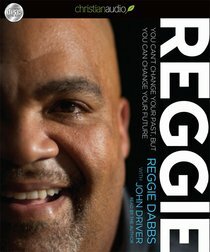 We love Reggie Dabbs and know that this book will be a source of great encouragement to all who read it. Reggie Dabbs is not only an incredible minister of the Gospel, but also a dear friend who inspires me with his testimony and ability to reach a cross-cultural generation that is searching for the truth in life. Reggie's heart for the hurting and broken is a true measure of the message of the cross and his ability to communicate with hilarity is captivating. Reggie is absolutely the real deal with a real message of hope! About "Reggie (Unabridged 5 Hrs, 5 Cds)"
The inspiring, true story of a man who went from nothing to speaking to more than two million people each year. Reggie Dabbs's life changed when in the second grade he realized his parents were not his real parents, and that his birth was the result of a twenty-dollar deal his sixteen year old unwed mother made to secure the food she needed for her three other children. Interwoven with humorous and thought-provoking anecdotes and illustrations, as well as stories from the Bible and his travels around the world, this is the true, chronological story of Reggie and his message for students and adults alike that they are powerless to change their past, but they possess a unique potential to change their future. Born to an unwed mother and fostered until he was adopted by the Dabbs in the fourth grade. Reggie is now in demand as a youth motivational speaker driving home the fact that 'You can never change your past, but you can change your future!' He resides in Ft Meyers, Florida with his wife Michelle and their son Dominic. Customer Reviews For "Reggie (Unabridged 5 Hrs, 5 Cds)"
Reggie was always a favourite preacher in my Planet Shakers days. He is passionate, relatable and powerful communicator. This audio book (read by Reggie himself) is his incredible biography, and tells of how a young, unwanted boy became of the most loved preachers of our day. Having heard Reggie preach multiple times (yes, he is your typical big, black and loud American guy) it was a little strange and amusing to hear him in a more melodic, subdued tone. But nevertheless it is a great story. I could not put the book down once I started reading it! Reggie is truly an inspiration to many people around the world and he continues to be an inspiration to so many others. Reggie's humor was definitely not lost as I found myself laughing all throughout. This book also leaves you with a message of hope and I would recommend it to anyone and everyone. Reggie is one of my favourite preachers live simply because it doesn't matter who you are, if you're a sold out Christian or an absolute atheist Reggie will speak to your soul. His testimony alone could change your thoughts and challenge the way you live. He is hilarious live  this book doesn't dim that one bit, humourous  full of Godliness. REGGIE: because He deserves capial letters! This is a book about REGGIE. I write his name in capital letters because he deserves it. It's REGGIE's life story up until now. It's a message of hope, and a message that a lot of people ? Christian and non-Christian ? need to hear. It's about how one man, who came into the world in the most unlikely circumstances, changed his life and the life of many because of God. It's about sharing with people that God can use anyone to share with others about how much He cares for and love us, His children. REGGIE is a wonderful motivator. Throughout my depression/anxiety journey there have been many moments when I've felt like I'm alone, that nobody cares and that I'm doing life without anyone. REGGIE has reminded me that I'm not alone, that people, and especially God, cares, and that I have many people who are doing life with me. REGGIE held my attention throughout this book with his witty manner. The same witty manner that captivates hundreds of school kids in gymnasiums, and thousands (even tens of thousands) of people in auditoriums all around the world. REGGIE conveys God's message of love in such a way that anyone can get it. I already love God and I now "re-get it". I would wholeheartedly recommend this book. Whether it be to a mature, new or in-between Christian, or a non-Christian, a staunch non-believer. REGGIE tells it like it is. God's truth about God's love.